"The Canadian churches are in danger of losing their 'reason d’être.' 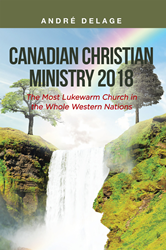 This book is oriented toward Canadian Christian ministries of all denominations and all Christians around the world who live in a so-called democratic country and has a Charter of Right of some kind to protect their faith and moral values. Published by Christian Faith Publishing, André Delage’s new book presents a goal of revamping every Christian’s learned values around the world and rediscover the true nature of spirituality in their lives.